Death Surf is said to be inspired by ‘the classic Italian “spaghetti sound”’, but, rather than re-imagining Ennio Morricone, what Valerio Mattioli and Francesco Figuereido really investigate here is more akin to some sort of nuclear winter. Hailing from a poor suburb of Rome where they spent some time hanging around a local scene, the pair have each gone onto working on their own projects before joining forces as Heroin In Tahiti and recording their first opus together. Their compositions are served by ill guitars, dark hypnotic electronics and minimal rhythmic formations, which owe as much to the coldest strands of new wave as it does to Krautrock. Death Surf is a sombre affair indeed. Perhaps named as a reference to Mururoa, an atol situated near Tahiti, the largest of the French Polynesian Islands in the Pacific Ocean, which has for decades been used as a nuclear test area by the French military, this album is ridden with stark stabs of electric guitars, which are left floating above thick layers of muffled electronics. The resolutely lo-fi approach only adds to the feeling of malaise which spreads over the whole record like a noxious gas. This is music which contaminates its surroundings as it slowly decays and crumbles; fragments of melody radiate feebly through dense atmospherics formations as minimal drum patterns pace in the background. There is very little change in the structure of these compositions through the whole record; Mattioli and Figuereido stick to the same formula from the title opening track to Heroin In Tahiti, which closes the proceedings, but they decline this set up through a variety of forms. The drone-like aspect of the title track is shaken up by deep corrosive pulses in its mid-section, and Campomorto is subjected to constant assault of feverish guitar textures, while later on thick layers of saturated guitars spread out like lava on Ex-Giants On Dope, and Sartana grows from bells and percussive noises into a much more epic construction. At times, the pair push the guitars slightly to the back to reveal their electronics more clearly, giving them the chance to develop more hypnotic structures, on Spaghetti Wasteland or Zoom most prominently, but the overall tone of the record remains largely unaffected by these slight alterations as Heroin In Tahiti distill the same chilling sonic blend all the way through to create a very consistent collection which, despite its resolutely lo-fi feel, at times sounds surprisingly epic and cinematic. 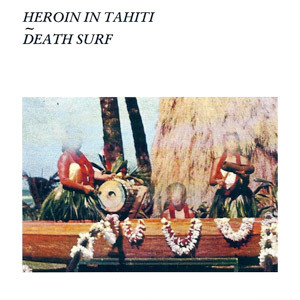 The compound of guitars, analog synthesizers and drum machines found here is particularly intriguing, making Death Surf a somewhat unsettling record. This is a vinyl-only release limited to 300 copies.